Once more unto the breach, first graders, once more. 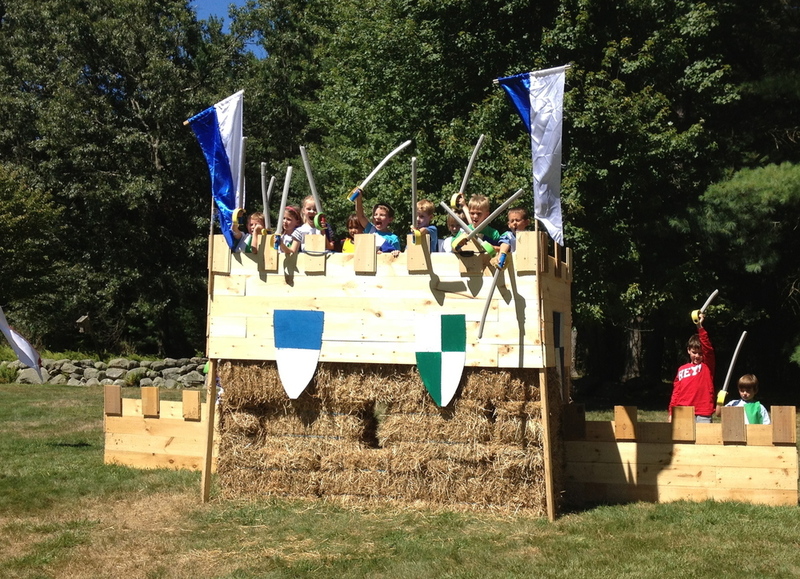 For his sixth birthday, the Boy said he wanted to have a castle in the backyard again. Thank God. I was afraid he was going to ask for something crazy that I wouldn't know how to begin building. A few bales of hay, scrap 1-by lumber and a few flags. And there you have it: a castle. I got a little bit creative this year and built a couple of practice dummies that pivot when you whack them. Just to give the kids a bit more of a target for their energy. Because every birthday party is made better by a whirling pointy stick or two. Our kids got a little bit of practice in the evening before the party. My Bride made up some tunics for the kids in opposing colors, and hung them out to put on as they arrived, along with a basket of foam swords and some spongeball artillery for water fights, in case it got a bit too hot. We hung the Boy's armor from last year up nearby to give them the idea. Since that armor was a bit small for my now-6-year-old, I worked up something new for him. I asked him what he wanted on the armor, and he said an eagle. And black, "like in Lord of the Rings." (I'm not sure which character he had in mind there. I'm not sure I want to know). So a few weeks in advance, I started putting something together for him. It turned out a little bit big and I trimmed it down a touch in the end, but that just gives him a little room to grow into it. Like any good armor for a six year old should have. We had sketched out some shields in advance for the kids to finish decorating. Last year I had tried printing out some designs that they could cut out and glue on. That was messy and unsatisfactory. The shields are way bigger than your standard 8.5 x 11 sheet of paper. This year, I free-handed in some basic designs with a handful of big sharpies and set them out for the kids to choose their favorite and make their own. This was way more satisfactory in the end. And easier. Come back with your shields, or on them, kids... or whenever you get hungry for fried chicken & lemonade. Whichever comes first. (That's my daughter's shield on the table. I told her to draw whatever symbol she thought might represent her. She heard "draw everything you like to do in the history of ever." Cooking. Painting. Horseback riding. Ukulele. Books. Violin. There's a pair of skates and a pair of skis on there. At one point she asked me how you draw "swimming"). 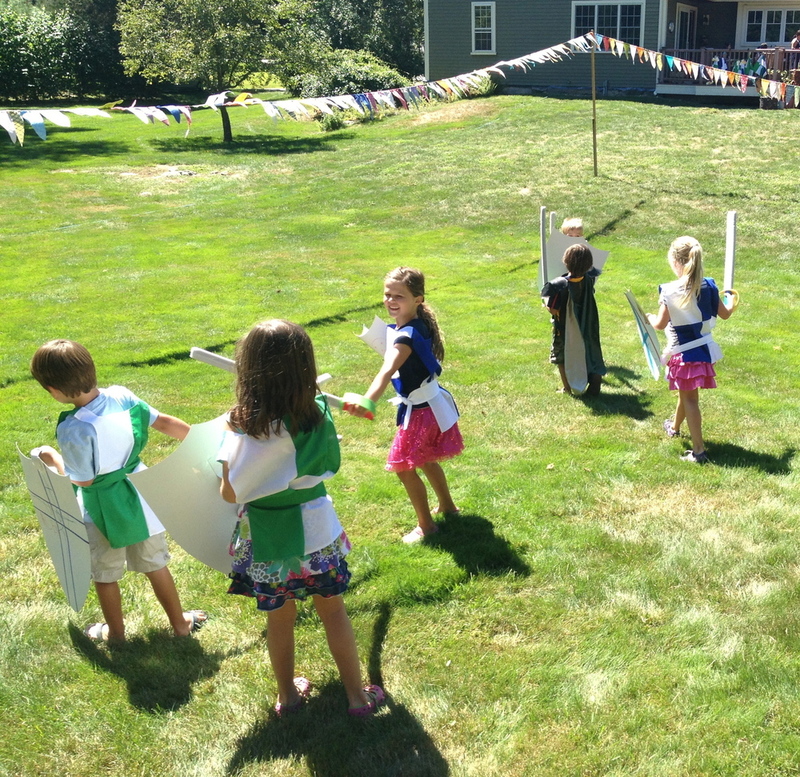 When the kids arrived, we donned the tunics, handed them a sword and shield, and sent them out to cry havoc. Our parties aren't really about scripted activities, but we tend to go heavy on the props. The Critter and her friend had painted a dragon for the party which we stood up to one side for a bit of additional challenge. The kids charged it, hurled water balloons and sopping wet sponge balls and defended it in turn. I was pretty pleased with how well the girls did in coming up with this wee beastie - we may have to save this one somewhere for posterity. And when the warriors had battled enough, we gathered in the weary wounded and had cake. Dragon cake. With gold treasure. It was chocolate cake, with a red velvet dragon. I'm not sure that the kids got the joke. But the adults did when I cut it open and served dragon meat cake. My beautiful Bride has the best sort of twisted sense of humor sometimes. And then the party was over, and it was time to say goodbye, and take the castle down again. The hens will appreciate the hay when the snow comes, the flags disappear back into the barn. and the wood never goes to waste around here. But I think the Boy will be ready to take the black if the moment comes.